On display in an EMP museum traveling exhibit – our custom mannequin for a Terminator 2 movie costume worn by Arnold Schwarzenegger in T2. 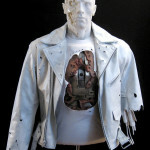 We created this Arnold Schwarzenegger sized custom mannequin to display an original Terminator 2 movie costume worn by the famed actor in the film. 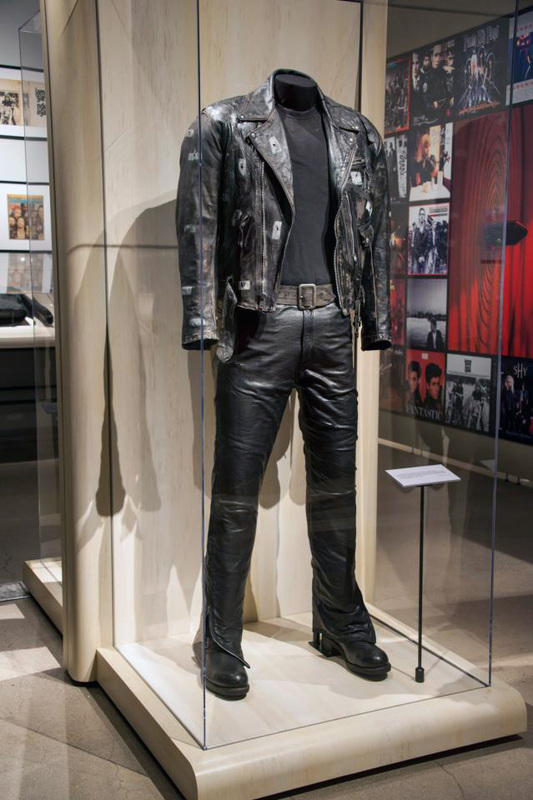 The figure was shown publicly in a traveling exhibit called “Worn To Be Wild” by the EMP museum. 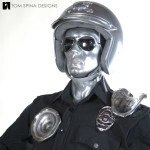 EMP is a leading-edge nonprofit museum, dedicated to the ideas and risk-taking that fuel contemporary popular culture. The “Worn To Be Wild”exhibit which was all about the evolution of the leather jacket from a utilitarian item of clothing to a symbol in pop culture. 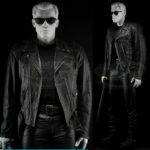 This particular Terminator movie costume includes a black leather jacket that features numerous “bullet hits” – areas where the fictional T-800 sustained bullets to his torso. Also of note are the tell tale production “tape marks” which at first glimpse may seem like an eyesore, but since the movie was filmed out of order, production sometimes needed to “erase” bullet holes in the jacket by using squares of black gaffer tape! 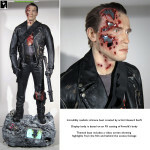 Those tape marks help match this Arnold Schwarzenegger jacker as hero wardrobe from the T2. 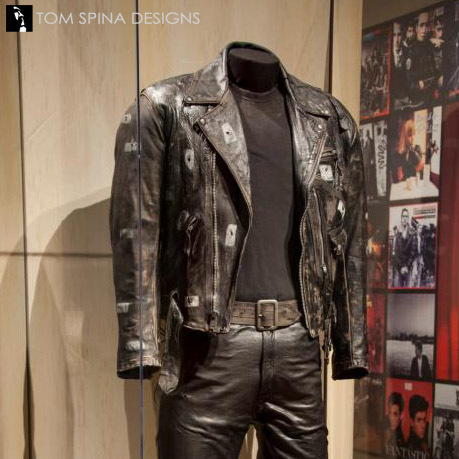 A somewhat minimalist appearance for the custom mannequin keeps all of the focus on the jacket and costume, which worked especially well for this exhibit since the focus was about the importance of the leather jacket in pop culture. 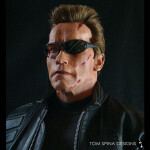 To find out more about the museum or to find the exhibit’s current city visit the EMP site.